What do you know? Turns out this is the very first krautrock music DVD I've ever seen. I do, however realize there are other similar titles out there. Just need to to seek them out. 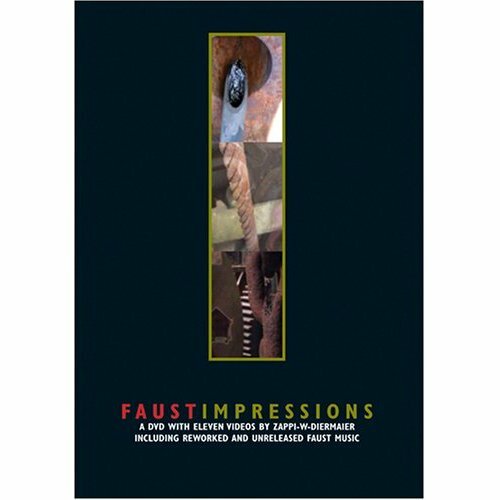 Faust has assembled an extremely tasteful collection of eleven videos and conceptual clips here for their long time fans to enjoy. Just a few of the pieces here I thought would be worth mentioning are "D-Machine" that shows the band members hanging out and dining with an unidentified person dressed in a bear costume, "Skin" is a two-minute snippet showing a fat bald man (appearing to be) in his birthday suit while jamming to the song and "Desert" is a very cool instrumental showing a passenger's view sailing down a city river. A couple others are "Listen", a superb twelve-minute krautrock epic, "Component" (from 1971) that features some way-out-there sharp guitar sounds and "Icy Rain" is also pretty happening, however it's actually the track "Rainy Day". These videos just might take you the first play to sort of get used to them, but the music through out 'Impressions' is truly outstanding, I thought. Each video is quite creative as well as stunning in their own right. Then there's a four track mini-album CD from original Faust member, Zappi-W-Diermaier. 'I Spin' is very much in the Avant Garde direction. The disc's final cut "Virtual Reality" is the best cut. No doubt in mind, that 'Impressions' is a absolute must-have.